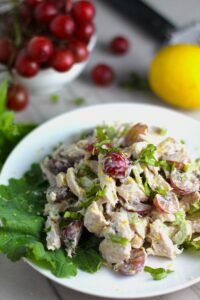 Lemon Basil Chicken Salad with Grapes is a bright, sunny, and delicious make ahead lunch or dinner. 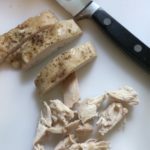 I first posted my Lemon Basil Chicken Salad recipe a year ago in August of 2017. I still love the simplicity of that recipe with the bright and fresh flavors. 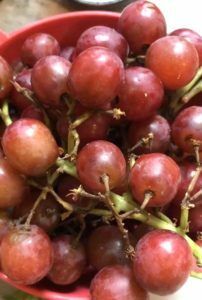 This time, however, I added even more flavor and texture with Grapes! While the recipe itself seems simple, let me tell you, the taste is anything but simple. 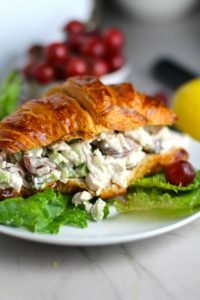 This Chicken & Grape salad has so much depth with layers of flavors and textures. 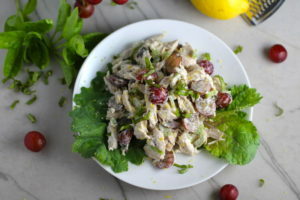 You get the hearty texture from the chicken, brightness from the lemon, the fresh and fragrant basil, a slight bite from the onion, and a huge juicy burst of sweetness from the grapes….so yummy! To add to the simplicity, this is a great recipe to use up leftover chicken or buy a rotisserie chicken and shred up the breast meat! No need to cook from scratch! Make this and eat right away or make ahead to eat during the week. It is a great option for taking to work. 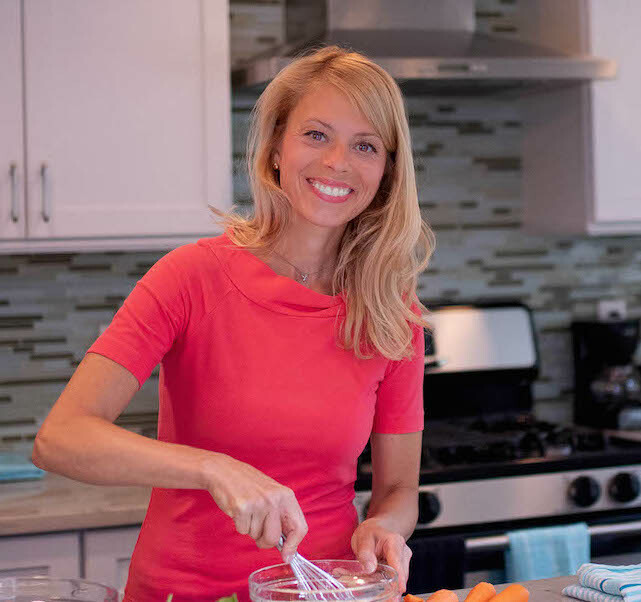 Top it over a spinach and carrot salad, scoop it with crackers, or eat on whole wheat toast. You can either portion out this Chicken Salad with Grapes into traditional Meal Prep Containers, such as these. Or you can pack it into a thermos, such as this MOST CUTEST and PRACTICAL OmieBox Bento Lunch Box with insulated thermos to keep your chicken salad cold. If you do not have leftover chicken, then it’s super easy to roast. Simply season with olive oil, salt, and pepper and put into 400 degree F oven for 25 minutes or until temperature reaches 165 degrees in center. 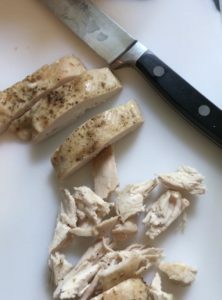 Once the chicken has cooled, cut it or shred it with your fingers or a fork into bite size pieces. While the chicken is cooking, you can be preparing the few other ingredients…halve the grapes, slice the basil, finely chop the red onion, zest the lemon. Add the shredded chicken, diced onion, and halved grapes to a medium to large mixing bowl. Then make the dressing, which is simply mayonnaise, lemon juice, lemon zest, basil, and salt and pepper. Add the dressing to the chicken and fold in until completely mixed. Taste for seasoning and add S&P as needed. 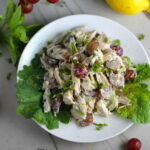 This Lemon Basil Chicken Salad with Grapes recipe is simple, but the taste is anything but simple. It has layers of flavors and textures. You get the hearty texture of the chicken, brightness from the lemon, the fresh and fragrant basil, a slight bite from the onion, and a huge juicy burst of sweetness from the grapes. Drizzle a little bit of Olive Oil and rub it all around. Then sprinkle all sides of chicken with Salt & Pepper and roast in 400 degree oven for 25 minutes or until temperature reaches 165 degrees in center. Cool Chicken. Once cool, cut chicken into bite size pieces. Add to a medium-large bowl for mixing. Finely Dice onion and add to the chicken. Halve the grapes and add to the chicken. To a small mixing bowl, add the mayonnaise. Zest the lemon with the small end of a grater or lemon zester. Add the zest to the mayonnaise. Then halve the lemon and squeeze the juice from one half into the mayonnaise (be careful no seeds fall in). Layer basil leafs and slice into thin strips and measure 2 Tbls. Add to mayonnaise. Add just a pinch of salt and fresh ground pepper. Mix all ingredients into the mayonnaise. Taste for seasoning and add salt and pepper as needed. Pour the dressing over the chicken, onions, and grapes and fold it in until completely mixed through and combined. Taste again for seasoning and add salt and pepper as desired. Serve and Enjoy! !